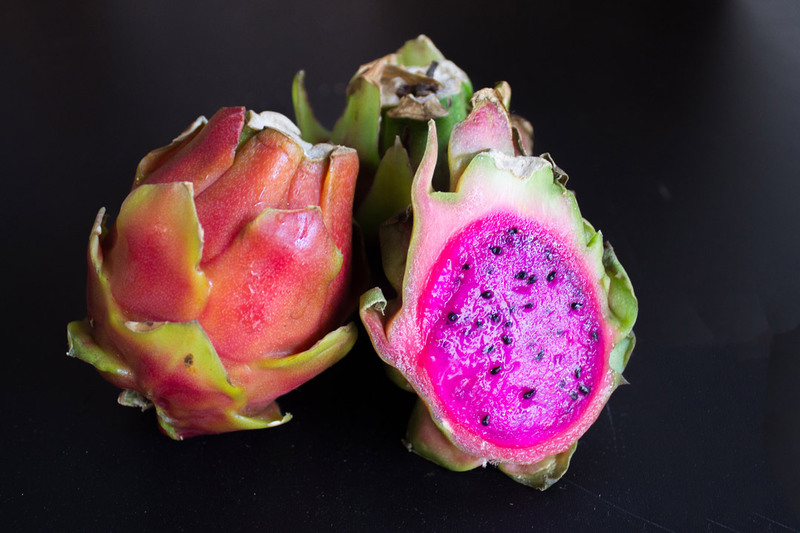 Named after a mythical beast for it’s scale-like appearance, Dragonfruit is without a doubt the coolest member of the fruit kingdom. 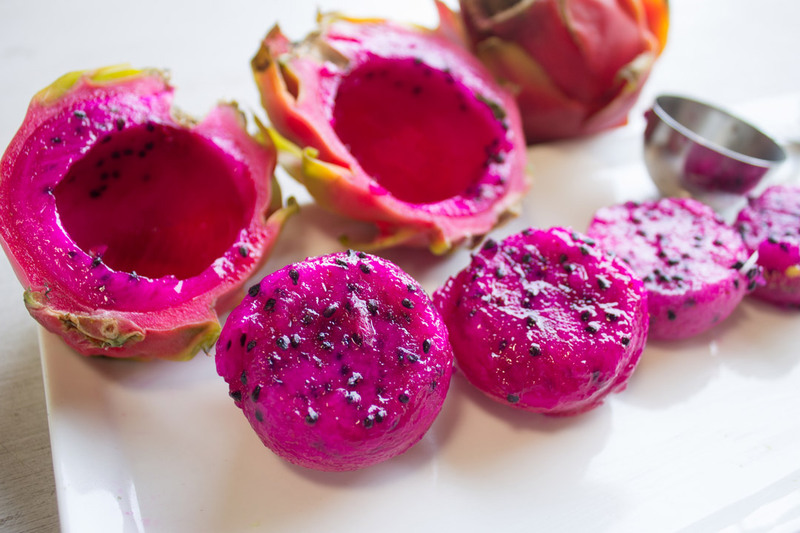 Dragon fruit, sometimes known as strawberry pear, is part of the pitaya family. One of nature’s most bizarre and unique fruits, it’s the only fruit on Earth that grows from the flowers of a cactus! These fruitful cacti are originally native to a Central America, especially Mexico, Guatemala, Costa Rica, El Salvador, and northern South America. They’re also popular in tropical locations around the world, like Southeast Asia, the Carribean, Florida, and Australia. Luckily, we live very close to another micro tropical climate, just a few miles south in San Diego, California, where our friend Pedro from Pedro’s Organic Ranch has been growing tropical fruit in between his rows of avocados. They have a tough outer layer, with spiky leaves, like a pineapple. The shape, size, color patterns, and leaf size all vary from fruit to fruit. Some varieties are small with lots of leaves, while some are large with very thin leaves, and some are long and thin. The flesh inside is juicy with little black seeds and is either bright pink or bright white. A few blemishes on the skin are normal, but if the fruit has a lot of blotches, it may be over-ripe. Hold the dragon fruit in your palm and try pressing the skin with your thumb or fingers. It should give a little, but shouldn’t be too soft or mushy. If it’s very firm, it will need to ripen for a few days. Ripe dragon fruit can sit on the counter for a few days. To store it longer, place the fruit in a sealed plastic bag and store it in the refrigerator. This fruit can pick up the flavors and odors of other food, so the protection is necessary. Don’t cut your dragon fruit until you’re ready to eat it. Once cut, it needs to be refrigerated in a tightly sealed container just like most cut fruits. It can remain fresh for a day, possibly a little longer, depending on how ripe it is. Once the flesh begins to turn brown and get mushy, it’s time to toss it. 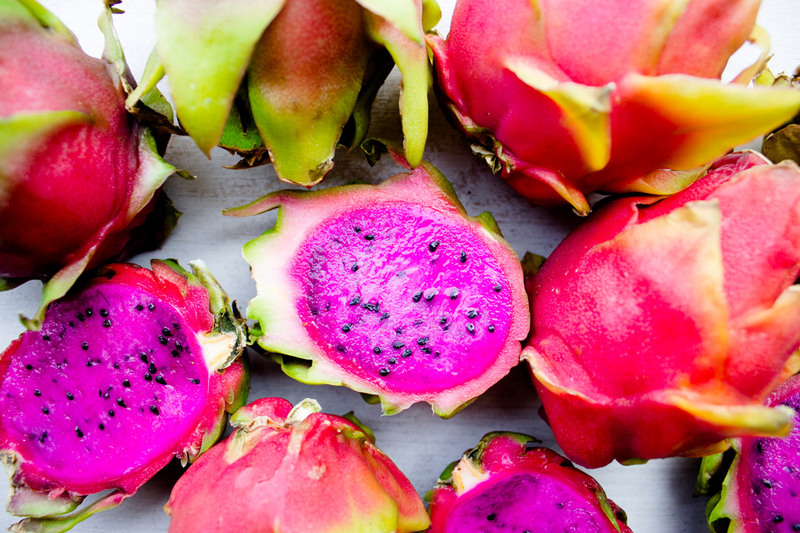 Despite its intimidating exterior, dragon fruits are very easy to get into and enjoy. They’re pleasantly sweet, mild, and can accompany a wide variety of flavors. 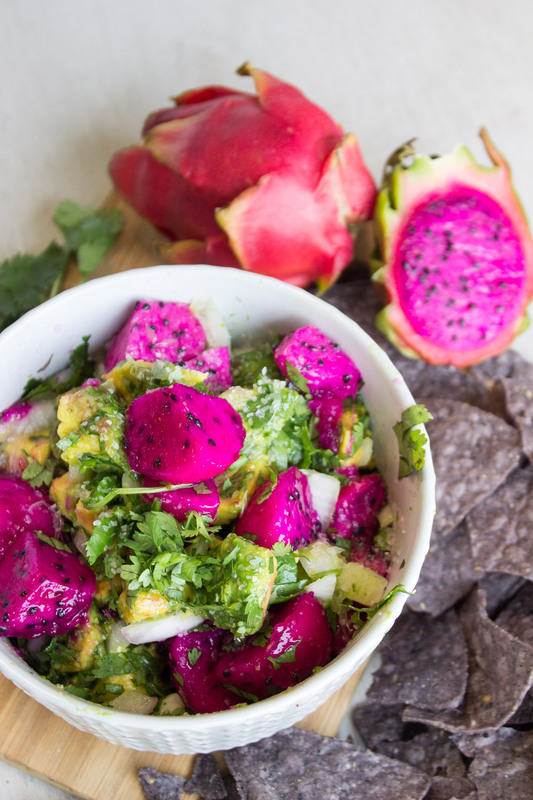 Enjoy them raw, blend them into smoothies, toss some into a fruit salad, or try our dragon fruit salsa recipe!